Good morning! For the longest time, I’ve wondered what would pull me out of my blogging drought, and here it is: Sausage gravy & biscuits. My daughter asked me to make these for breakfast this morning. She rarely eats before school, and especially lately, we’ve been doing the keto-friendly “bulletproof coffee” instead. (Mr. Ketogenesis would definitely frown upon the carbs loaded in this gravy and the accompanying biscuits.) I saw the sausage in Harris Teeter yesterday and heard Mama’s voice tell me to make this time-honored Southern staple. I don’t make it often, but when I do, it’s so good. It’s one of those things that releases the flood-gates of childhood memories the way only kitchen smells and sounds can. It’s a visceral reaction to grease popping, coffee brewing, and trying to keep a glass-top range clean from the speckles of pork grease. I’m no biscuit master like Mama was. 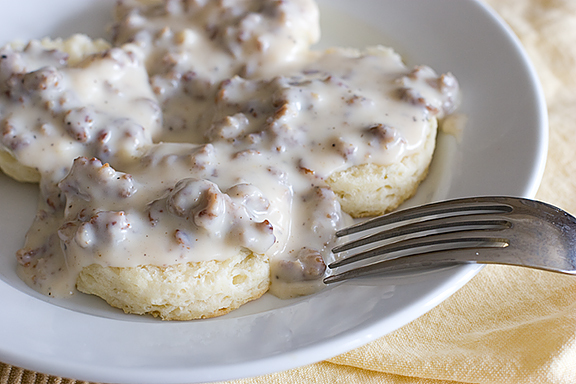 As a matter of fact, I’ve been known to “cheat” by using canned biscuits or in a pinch, serve the sausage gravy over toast points. All of it’s good. . . really good. I mentioned coffee earlier, but if sweet tea is in the fridge, that’s the perfect beverage to accompany this. I always have to have a touch of sweet to go along with any pork dish. A treasured photo. 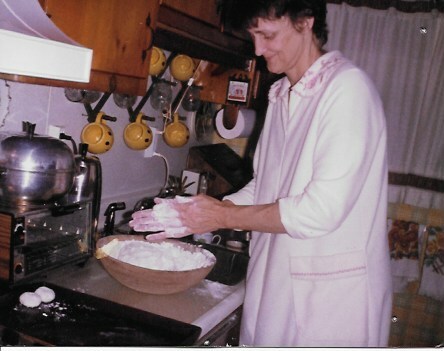 Mama making one of the things she did best: the lightest, fluffiest Martha White biscuits you ever tasted. My mom made the BEST biscuits every Sunday morning. Every time I try, her exact recipe, they come out hard as rocks! But, I have to say, I learned the sausage cravy well! My son would eat it 3/day! Kathi, what ingredients do you use for your gravy??? I use sausage drippings, flour, milk, seasonings, and crumbled sausage. Never went by a recipe. Mama just made it happen. Do you remember the Sunday dinner she whipped up from just one plug in skillet and managed to have it all hot at the same time? I have memories of being on her hip while she cooked….. watching and learning. I’m so grateful to come from such amazing Southern cooks. I totally forgot about that electric skillet! And I feel grateful for the same reasons you do 😉 Thank you, Biss. My Mama Ollie made the best biscuits in my family. She had 20 mouths to feed.Loved babies I guess. Her kitchen had huge sacks of flour, grits, sugar & cornmeal. Bushels of potatoes and onions and other root vegetables had to be culled every morning to pull out the bad ones less they spoiled the rest. My sister Lou and stood on top the sacks like foot stools to watch her. She had cured hams hanging in the corner of the room and the smells…I miss them all. That must have been some kitchen of Mama Ollie’s. Probably where the roots of your vast cooking knowledge comes from! My mama makes biscuits & gravy for my “babies”~ she learned from her Grandmother (who Lola Mae is named after)… this looks amazing P! !